Now to those not working on it every spare moment in between everything else in life you need to keep going, it may seem the progress is slow. Well, it is, especially with only two people committed to a project larger than life! Taking on a project of this size….the barn is 40 x 80. That’s that size of a 6400 square foot home. It’s easy to get overwhelmed, so we really do take it one board at a time. To have the experience of building something of that size with your own two hands, knowing what goes into building a structure, knowing this will last longer than we are here on earth to appreciate it, is something I wouldn’t change for anything. I understand not everyone will have that experience nor do they have any desire. But when people say ‘oh, it’s just a frame’, I would imagine it’s how an artist feels when they see people walking by their artwork and not giving it the time to notice all the detail put into it. That frame is ……. over 1200 poles, boards, braces, and blocks, more than 23,000 HAND NAILED nails, and countless hours of labor……and that’s just the frame. Many more boards and nails to go, but with every board it gets closer. 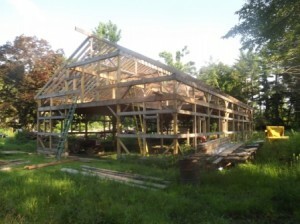 More pics of our progress have been added to the Farm Livin’ page. The weather has been a challenge this season, and everything has been delayed about one month. Our bees are doing well, but we expect to be extracting later in the season. We’ve also continue to choose between tending crops or barn building, and crops are usually on the losing side. Nevertheless we appreciate those who continue to stop at the honor system stand even when there is a limited supply to offer. The Windsor Farmer’s Market began and we’ll be there various dates through October. Over the past couple of months, The Hartford Courant did a feature on us and the farm in the paper. We’re have a couple additions to the farm. We have our intern Nathan. It’s a new experience for all of us to have someone else around who is excited about sustaining the bee population and the benefits of the simple life! Welcome Nathan, glad to have you as part of the farm! 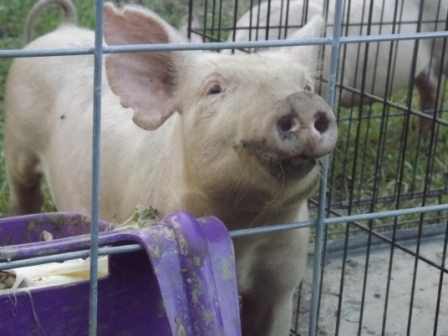 We have pigs now. It’s my first experience with pigs. I have to say they are very different than then herd animals we’re used to having around. They don’t seem to care about anything but eating and sleeping. 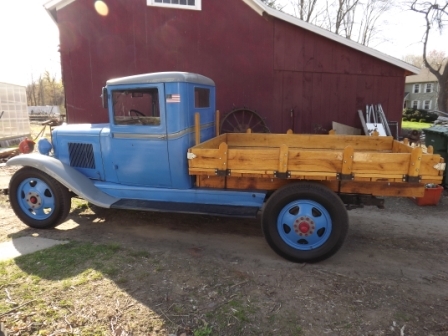 And our most fun addition, our 1931 Chevy Independence. Top speed of 50 mph! It’s been fun having it around the farm and sharing stories of those who have the same appreciation for old trucks. Next time we talk, another season, another favorite activity…..extracting honey!